Few chroniclers of modern war possess the impressive bona fides of Bing West. He lived the life of a Marine infantryman in Vietnam and served as an assistant secretary of defense in the Reagan administration, so he has experienced the military world at the lowest and highest echelons, in peace and in war. Perhaps most impressive: he has during the past several years made numerous trips to war zones in order to report back to America. Two previous books, No True Glory and The Strongest Tribe, are firsthand accounts of combat in Iraq. 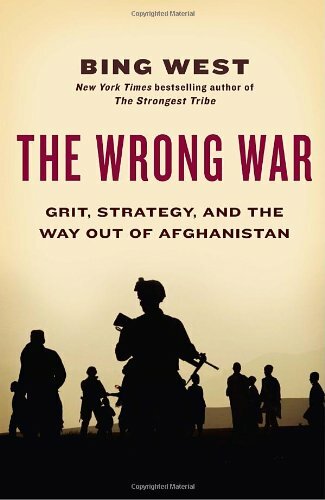 His newest, The Wrong War: Grit, Strategy, and the Way Out of Afghanistan, is the result of extended periods of living with the troops there. As a man of seventy who has other options, West earns my admiration for his willingness to not only travel to some of the scariest places in the world, but to report on them from a grunt's-eye-view, foregoing electricity and running water, wading through canal muck, and dodging Taliban bullets. The Wrong War describes the U.S. counterinsurgency fight in two crucial Afghan provinces. The book's first half takes us to the ruggedly mountainous Konar Province, where the documentary Restrepo was filmed. Its second spotlights the centerpiece of Gen. Stanley McChrystal's counterinsurgency plan, Helmand Province. Both sections point to West's central themes: the nobility and proficiency of the U.S. infantry in Afghanistan, and the tragedy that has nonetheless resulted due to vacillating and unwise direction from senior American leaders.